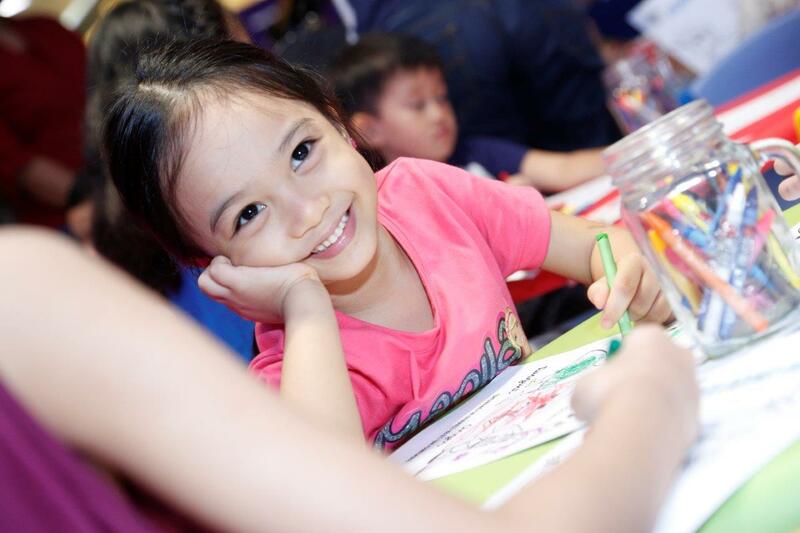 But before watching the film, moms and kids were treated to an afternoon of learning and bonding through the Express Yourself Parenting Workshop, organized by SM Cinema and its official food unit, Snack Time, and the country’s top parenting magazine and website, Smart Parenting. My little cute girl. Such a charmer! Before the program started, the kids had a chance to colour Inside Out characters. With Joy, I mean, the host for the event, Mary Viernes. The program consisted of talks about food and colour. 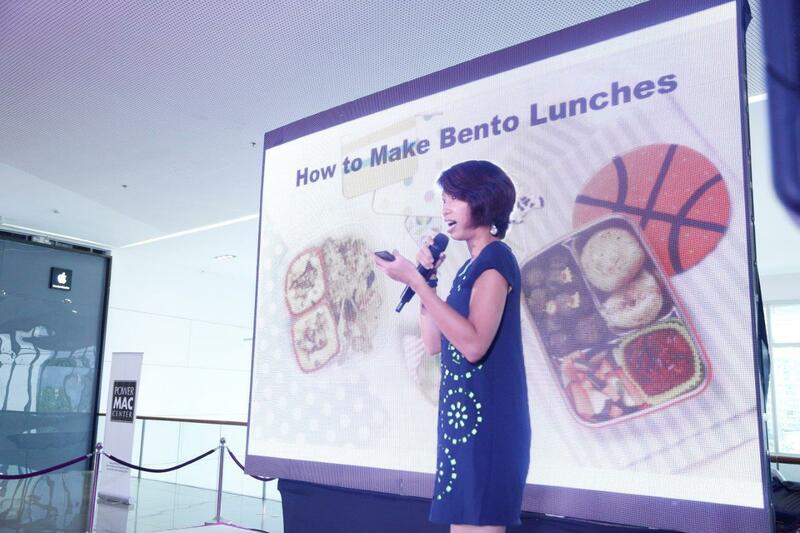 With Good Housekeeping’s Food Editor, Chef Roselle Miranda, who gave tips on how to make quick and easy bento lunches. 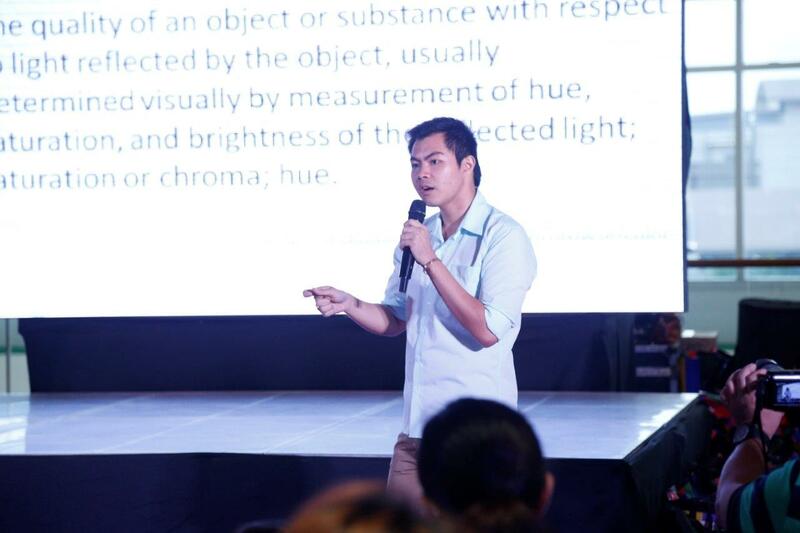 Since the characters of the movie, Inside Out were just colourful, the event also had Mark Dean Lim of Color Me Doodle talk about colours and their meaning. The Activity Center of SM Aura was filled with various booths and activities to choose from. Food and drinks were also served. Moms and kids listening to the talks. 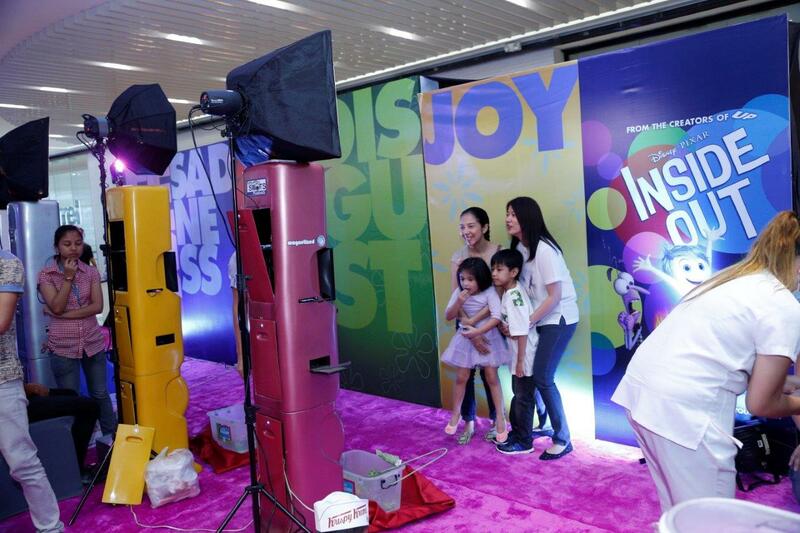 Photobooth to capture the happy faces. Joy indeed. 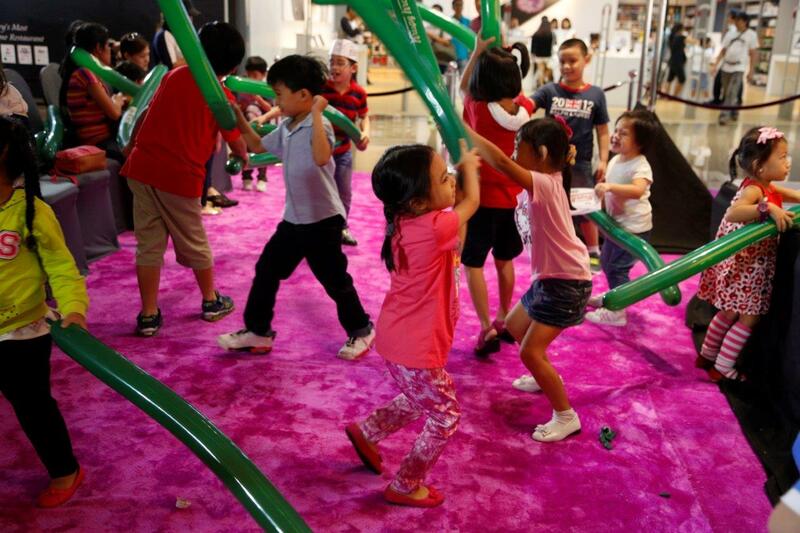 Kids being happy and content playing with these Krispy Kreme balloons. Moms got to try some pampering, too! I tried out hand paraffin and back massage from Bioessences, one of the sponsors of the event. After which, at five in the afternoon, we went up a floor to the cinemas for the exclusive preview of Inside Out. The movie is already showing since August 19, and I’d really recommend it for parents and kids alike. This is a good movie to teach emotions to children. And it will make us proud that a Filipino co-directed the movie. Indeed we are making waves in the arts! So, come visit your nearest SM Cinema to watch Inside Out! Once again, a huge thanks to Smart Parenting for the invitation, and SM Cinema and Snack Time for organizing this event! The pre-movie activities prepped us all for the movie, as we have created wonderful memories with our children. Another ball of Joy in their memory bank, or perhaps in their Core Memory! Ok, better watch before I spoil too much! The pioneer brand of SM Lifestyle Entertainment Inc, SM Cinema begun in 1986 as SM’s household brand for movie watching. Now encompassing 60% of the country’s total market share for cinema and exhibition, SM Cinema boasts of 284 fully digitized theatres in 51 branches nationwide, and three big brands under its name. As the front-runner in theatre innovation, SM Cinema will be expanding to more regions, and building more cinema screens in a branch near you. SM Cinema is the country’s leader in movie entertainment. 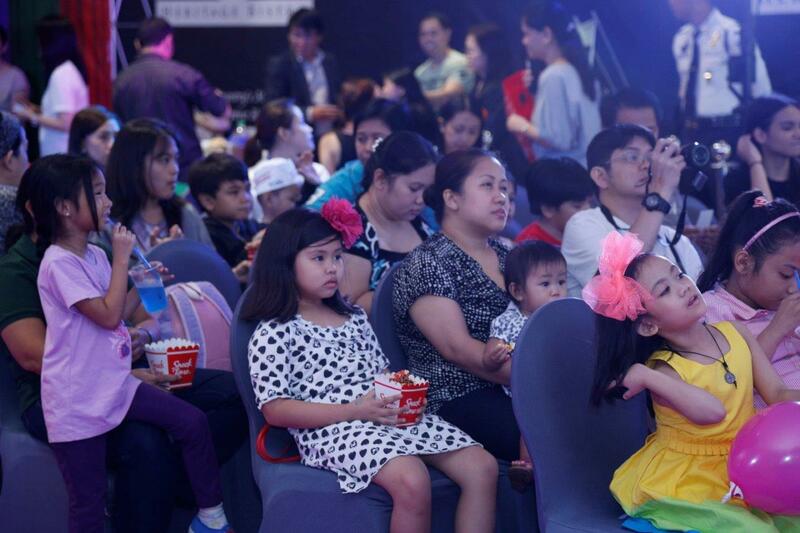 The sole food concession unit of SM Cinema, Snack Time is also available at the Mall of Asia Arena, Exploreum, SM Bowling Center, SM Skating Rink, and in WM Cinemas. Snack Time offers a wide variety of food: from snacks such as popcorn, burgers, sandwiches, corndogs, and drinks to meals fit to be served at formal events, Snack Time is one of the biggest food operators in the entertainment and lifestyle business. Snack Time is also the merchandise arm of SMLEI.